For this addition to Beauty and the Geek, I wanted to do something a bit bolder than usual that also honored one of my all time favorite comic characters: Tim Drake as Red Robin. I recently had my first tattoo done, and it was of, you guessed it, the Robin symbol. When experimenting with bolder makeup or costume styled makeup I’ve recently begun doing a trial run. The day before, I’ll just practice and play around with colors and styles to see where I want to go with the look. It makes getting ready go a little faster the day of, since I already know what I’m doing and how it needs to be done. It also helps if you have a standard makeup routine already set in place. Moisturizer – I use Neutrogena Combination Skin Moisture. Primer – I use NYX Studio Perfect Photo-Loving Primer in Clear. Foundation – I use Maybelline Fit Me Matte + Poreless Foundation Powder Normal to Oily. Eyeshadow (optional) – I use various ones, although I’ve recently been using Wonder Woman’s eyeshadow palette. Eyeliner – I switch between Wonder Woman’s liquid black liner and Revlon ColorStay Skinny Liquid Liner. Lipstick – Again, I use various lipsticks. When I do full face, I switch out my foundation for Kat Von D’s liquid foundation, and I use Maybelline’s Concealer Stick in regular and green. For costuming makeup, I usually go full face, but I don’t think it’s a requirement. Ultimately, whatever you decide to put on your face should be your choice and fits with what you’re most comfortable. 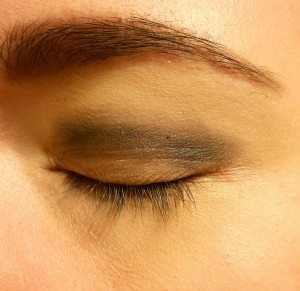 The first thing I do is lightly brush black eyeshadow into the crease of my lid. I use ELF’s Contour brush from their Studio brush line and black shadow from NYX’s Smokey palette. I’m always very careful when using black eyeshadow. It can be very messy and hard to clean up if you’re not careful. 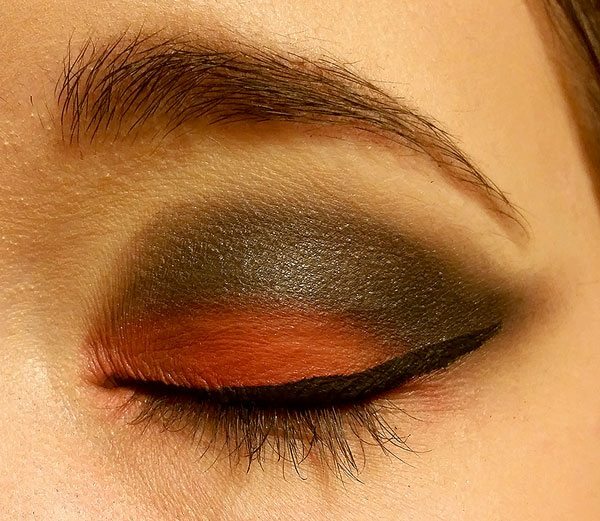 It’s easier to go back and put more eyeshadow on than it is to go back and take it off. After a bit more blending, I add more red shadow to get a bigger pop of color. There’s going to be some fallout when it comes to most shadows I’ve found. I use a soft face brush to sweep away any fall out without smudging up my face or leaving streaks of color behind. Now, I break out the eyeliner. 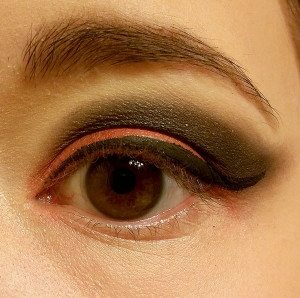 For this look, I think you could use a pencil liner for a better effect since black pencil liners smudge really well. I used a liquid liner instead from Walgreen’s Wonder Woman collection. I don’t use the applicator that comes with the tube; I use my ELF Eyeliner brush from their Studio collection. It has a bent tip, which helps contour to your eye better and gives me more control over where my liquid liner goes. I tried adding a bit of gold glitter to my liner and waterline, but it didn’t work as well as I hoped. Red Robin has that tiny spark of yellow in his costume, so originally I had hoped to work some yellow into this look. Next time, I might look for yellow eyeliner or something similar to substitute for black liner. I’m a huge lipstick fanatic, so whenever I do a geeky makeup look I have to somehow work lips in. I’ve recently been lining my lips with concealer first—using NYX’s Wonder Stick—to better line my lips. 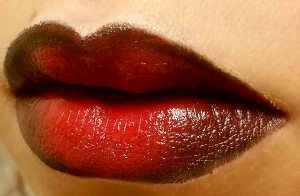 Then I fill my lips in with color, before lining them with my lip liner of choice. 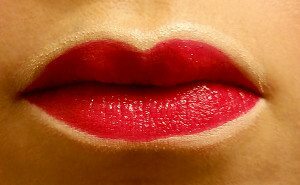 As you can see, when you do that ombre effect for your lips you have to blend the colors together, especially when they’re contrasting colors like red and black. An easy way to do this is by pressing your lips together in a smacking/popping motion carefully and gently. Don’t be discouraged if it doesn’t work the first couple times, you can always go back and blend some more if needed. A lip brush will help, but it’s not necessary. 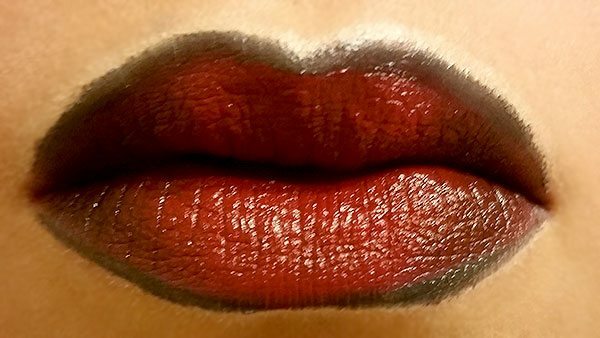 NYX makes ombre lipsticks that take away some of the process. 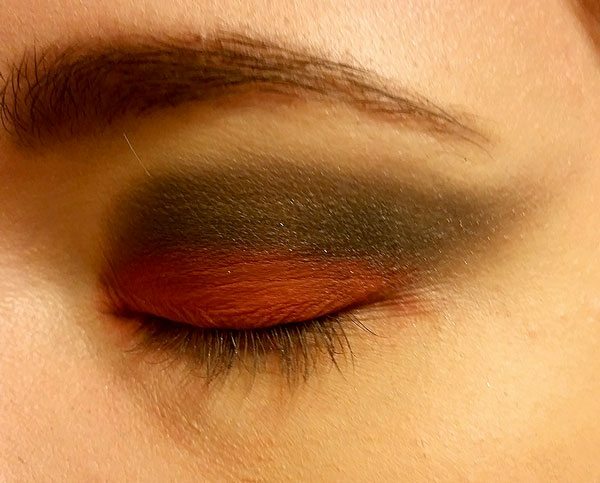 I used Hearts and Spades, but substituted the red shade included with NYX’s Alabama and Monto Carlo—but they’re pricey. 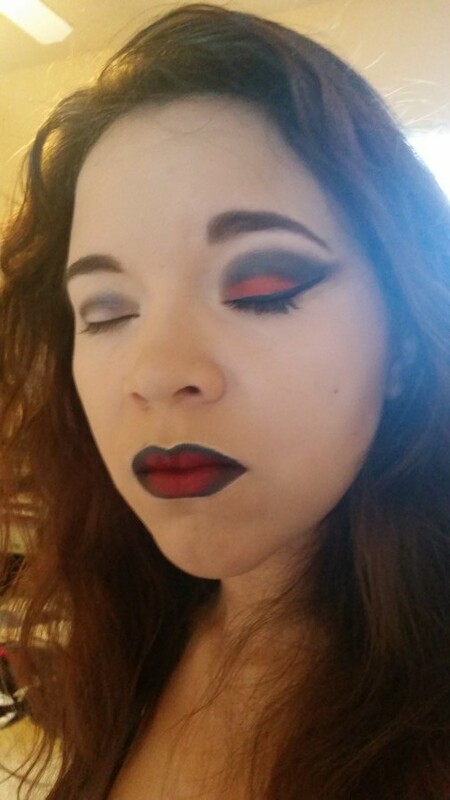 I recommend just finding a good couple lip liners—NYX’s are great and what I use—and just playing around with colors. 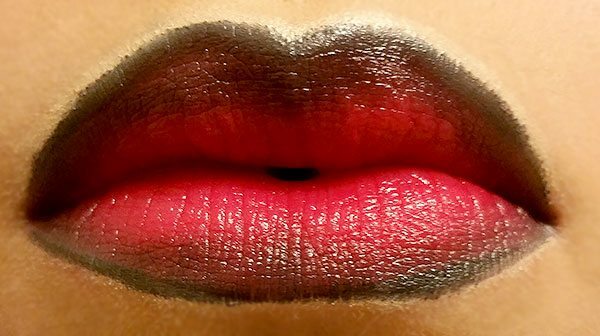 Blending is the hardest part, and you can use your finger or a lip brush to better blend your colors together. 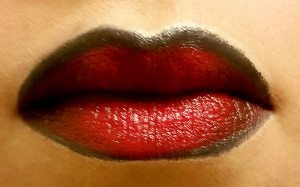 After blending my lips together, I went back and re-lined my lips by filling them in with black around the corners a bit more, pressed my lips together a few times, and adding more red lipstick to the center. And that’s it! 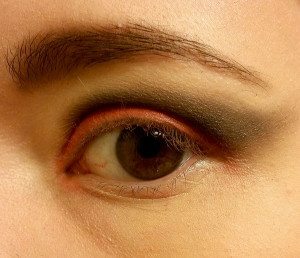 There are a few improvements I’d like to make, including more red eyeshadow and somehow incorporating more yellow into the mix. For now though, I’m pretty glad with how it turned out. I think I did Tim Drake proud. Now if only DC would do the same.